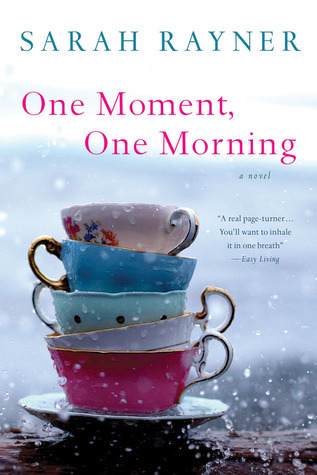 Today I'm featuring One Moment, One Morning by Sarah Rayner, which I borrowed from the library. Lou is pretending to be asleep, but out of the corner of her eye she is watching the woman opposite put on her make-up. She always finds it fascinating, watching other women do this, constructing themselves, on the train. Lou never wears make-up, really, other than for very special occasions, and although she can understand it saves time, she finds it odd -- choosing to make the transformation from private to public persona whilst commuting. It takes away the mystery, covering the blemishes, thickening the lashes, widening the eyes, plumping the cheeks, surrounded by people. And on the seven forty-four to Victoria, Lou is surrounded by people: most of them silent; many of them asleep, or at least dozing; some of them reading, and a few, a minority, chatting. 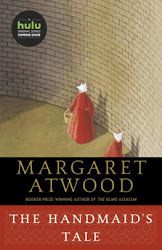 Page 56: "The hospital is a maze of corridors and wards, annexes and Portakabins, and neither Karen nor Anna is in the right frame of mind to work out the signs." My thoughts: The opening paragraph is very familiar to anyone who travels regularly to a job by public transportation. Yet, in this case, what starts out as an ordinary morning train commute changes the lives of three women and their families. From Goodreads: The Brighton to London line. The 07:44 train. Carriages packed with commuters. A woman applies her make-up. Another occupies her time observing the people around her. A husband and wife share an affectionate gesture. Further along, a woman flicks through a glossy magazine. Then, abruptly, everything changes: a man has a heart attack, and can't be resuscitated; the train is stopped, an ambulance called. For at least three passengers on the 07:44 on that particular morning, life will never be the same again. Lou witnesses the man's final moments. Anna and Lou share a cab when they realise the train is going nowhere fast. Anna is Karen's best friend. And Karen? Karen's husband is the man who dies. Telling the story of the week following that fateful train journey, One Moment, One Morning is a stunning novel about love and loss, about family and - above all - friendship. A stark reminder that, sometimes, one moment is all it takes, it also reminds us that somehow, and despite everything, life can and does go on.